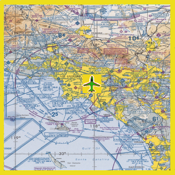 World Aeronautical Charts (WAC) is aeronautical charts used for navigation by pilots flying primarily moderate speed aircraft and aircraft operating at high altitudes. All USA lower 48 states, Alaskan charts and the Mexican/Caribbean charts are included in 12 WACs covers the continental United States and 8 others cover Alaska. Download all 20 Maps free when you purchasing this app. All maps are location embedded. Map view engine is very fast and updates are real-time with current GPS location embedded on the map with Green airplane icon.